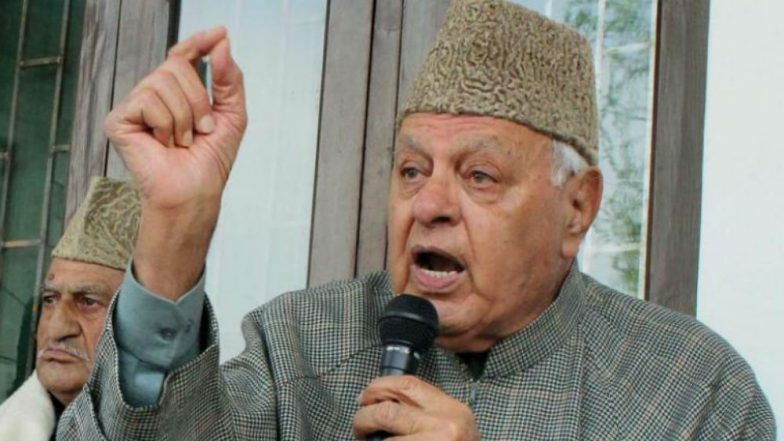 Srinagar, April 14: NC president Farooq Abdullah Sunday dubbed Prime Minister Narendra Modi and BJP president Amit Shah "biggest enemies of people", alleging that they want to divide the country. "PM Modi and Shah are the biggest enemies of people who believe in dividing the nation on basis of caste, creed and religion. But the people have made it a point not to fall prey to the divisive agenda of the BJP," Abdullah said. Amit Shah Will Become Home Minister if Modi Returns to Power, Says Delhi CM Arvind Kejriwal. The National Conference (NC) patron accused the BJP of trying to divert people's attention by propping up emotive issues. "These people want to change the very framework of the Constitution of India, which grants equal rights and opportunities to everyone. It is the Constitution of India which grants rights to profess any faith. It is the same Constitution that confers upon our state certain constitutional safeguards," Abdullah said. Abdullah said the BJP manifesto reflects the BJP's hatred for the identity of the state. Alluding to the Peoples Democratic Party (PDP) and People's Conference (PC), Abdullah said the BJP was using its "cronies" to weaken the special status of Jammu and Kashmir. "To meet this purpose, they have employed various henchmen in our state, such cronies can be seen holding inkpot (PDP's party symbol) and apple (PC's party symbol) in their hands. The sole aim of BJP and its cronies is to make non-state subjects buy land and property in our state," he said. The NC president said these polls would decide if India remains secular or not. "Our fight is with the divisive forces. We should utilise our power of vote to show such forces as are inimical to our special status their right place. They can go to any extent to grind their axe, they will use men, money and machinery to coerce the voters," Abdullah said. He warned any mistakes will have serious repercussions for the coming generations. Abdullah said the National Conference would not allow anybody to fiddle with the state's special status.